I was in the house and reminiscing about yesterdays Starling catch. I was telling my husband about how I happened to look out the window and see the starling in the holding cage. While I was telling him I of course, go through he motions and look outside at the trap…and what is that!!! I look from in the house. I couldn’t have caught ANOTHER Starling. Maybe a love crazy purple martin?….nah. What the heck, there is something in there. It wasn’t my eyes deceiving me. It was the most beautiful Eastern Screech Owl. Tan in color with big yellow eyes. It was trying to catch some zzzz’s there in the bottom of the holding cage. 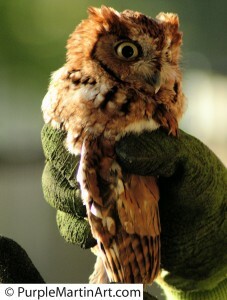 I put on a pair of gloves (No need to fool with that beak) and let the poor little fella out. So amazing to hold. It flew off, none the worse for wear and I was again amazed at the world we live in. We get so wrapped up in our lives sometimes and just the nature around us is enough to awe, inspire and renew your spirit. This entry was posted on Friday, March 21st, 2008 at 9:48 pm	and is filed under www.purplemartins-r-us.com. You can follow any responses to this entry through the RSS 2.0 feed. You can leave a response, or trackback from your own site.